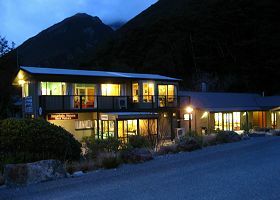 The Mountain House is a unique and delightful place to base your Arthur's Pass vacation. We can provide various styles of accommodation from backpacker-style, private rooms, to a family room. We can cater to the needs of the independent traveller through to families or groups. The National Park at your doorstep provides numerous day walk and tramping opportunities. In winter take your choice of five local ski fields. Visit alpine meadows with their wild flower displays and rare native birds. Have an adventure in local caves, canyons, or climb to stunning mountain tops and glaciers. Note: If you think you may arrive at our hostel after 6pm please contact us for instructions!